Play Carbine Studios’ sci-fi MMO ahead of its June 3 launch. 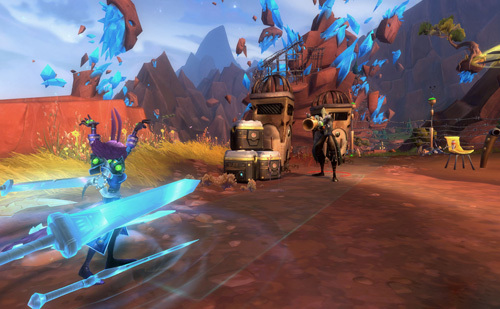 Carbine Studios and NCsoft have announced the open beta date for WildStar. The sci-fi MMORPG’s open beta test will start tomorrow, May 8 and run until May 18. From May 8th to May 18th, you will be able to visit our Open Beta page to request a key, and then hop into WildStar to experience content up to level 30. If you have already participated in any other WildStar beta event, including beta weekends and stress tests, you don’t need a new key. Just patch up, and you’re good to go! WildStar is slated to launch worldwide on June 3, 2014 for PC. The game is available for pre-order now at a starting price of $ 59.99/£34.99. You can learn more about the game and sign up for open beta on the WildStar website. Tagged Beta, Open, Starts, Tomorrow, Wildstar.